Louis Vuitton was the first brand to start using canvas rather than leather! This had a few advantages, including the waterproof design and increased resistance to the tear and wear. Even today, their products are known to be some of the most durable fashion items on the planet! Saint Michel is one of rare bags which features the best of both worlds. The materials are just perfect in any way possible. We have Monogram canvas, for durability and Epi leather, which is added to transform this bag into something else. The leather is located on the flap, while the canvas is used for the body of the bag. Thanks to the adjustable and removable shoulder strap, the bag is practical as much as it gets. 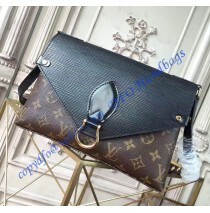 Removing the shoulder strap is easy and it will take you a few seconds, which is standard for Louis Vuitton bags. The all-new feature this bag has to offer is a ring-based design of the flap. It is specifically made to be as amazing as possible and to make this bag look impressive. Furthermore, the flap design is used to help you with attaching additional pouch which will be used as an additional pocket. Perhaps the size is small, but this is a practical bag. It features a larger compartment inside, additional one at the back and a smartphone pocket. The pocket for smartphones is larger enough to accommodate even the largest devices and it features easy reach. 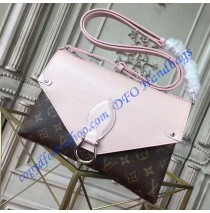 Small and chic bag, practical and convenient are the best words that describe Louis Vuitton Saint Michel with Epi Leather. It is truly a remarkable product, made by one of the best names in the business. Carrying the bag in your hands or using it with a shoulder strap will allow you to get the most from its dual-material design.